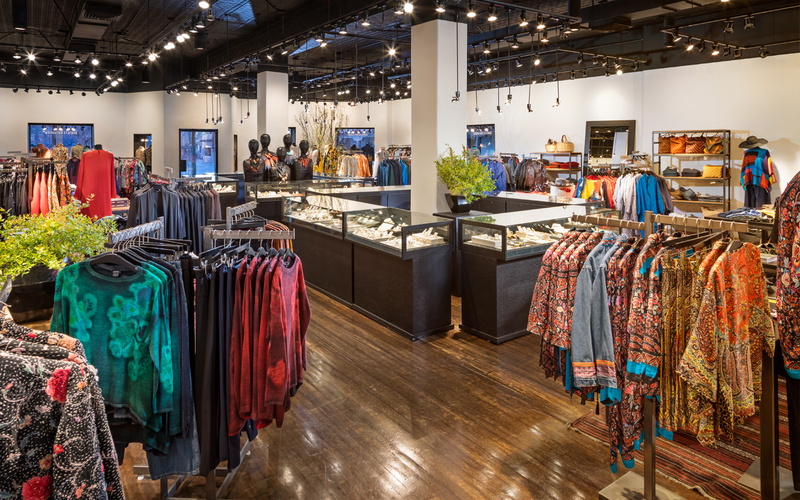 Santa Fe Dry Goods was opened in 1979 by Greig and Helga Porter at a time when the aesthetics and freedom of the Southwest became fashionable worldwide. In 2008, Greig and Helga’s daughter Shobhan purchased the business and set out to bring an increasingly global aesthetic to the store that is both intentional and forward-thinking. The store has always represented designers exploring unique adaptations of shape, texture, and color. With over 4,000 square feet on the plaza, Santa Fe Dry Goods is a mainstay of the historical and cultural hub of downtown. The aesthetic roots of the company stem from the exploration of old and new, local and global, complex and simple. Ultimately, Santa Fe Dry Goods aims to provide a rich and varied aesthetic to clients who are bold in their life’s works, highly independent, and who find refuge and enjoyment in beauty. Natural elements are incorporated into each aspect of presentation to give the client a sense of each designer’s strengths and expressions of identity.